It’s time to cheer on the 2017 Super Bowl Teams and with Sally Hansen’s nail color collections, you can show your team spirit instantly! Whether you are cheering for the New England Patriots or the Atlanta Falcons, Sally Hansen has the shades for you. If you are rooting for the Atlanta Falcons, here are your shades! Complete Salon Manicure in Red My Lips and Hooked on Onyx- Sally Hansen's Complete Salon Manicure™ colors are formulated with a base coat, strengthener, growth treatment, color, top coat, chip-resistance, and a glossy gel-style finish. A flawless finish brush ensures an easy, smooth, streak-free application for a salon quality manicure. The result: color that lasts for up to ten days. 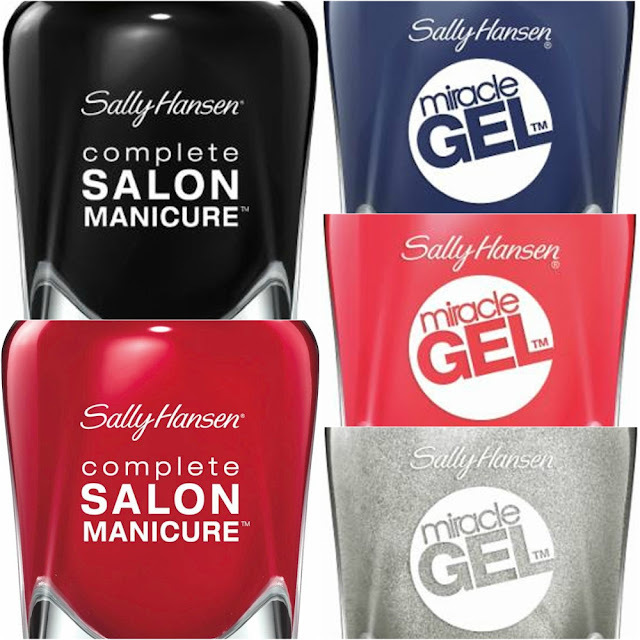 If you are rooting for the New England Patriots, here is your color fix: Miracle Gel in Midnight Mod, Buffalo Nickel and Red-gy- An innovative and award-winning development in nail color, Sally Hansen Miracle Gel™ is a two-step, no light gel manicure system; simply apply two coats of the Miracle Gel™ color of your choice, then follow with the Miracle Gel™ Top Coat. The polish is cured by natural light, so you can get the same volume and high gloss, mirror shine without the use of a UV lamp. Enjoy up to 14 days of color and shine, and then easily remove with regular nail polish remover – no soaking necessary!